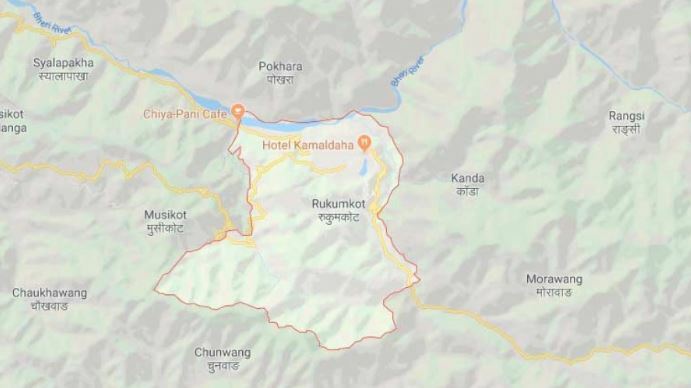 Rukum (East), 4 February : A curfew order has been imposed at district headquarters, Rukumkot, after dispute on location of headquarters turned a nasty turn. The District Administration Office Rukum (east) issued the curfew order effective from 7.00 pm Sunday until another notice. With the continuous protests from locals of Rukumkot and Golkhadam, the district administration resorted to clamp curfew to curb possible untoward incidents. Mitra Lal Sharma, Chief District Officer, said the order was to ban assembly, rally, gathering and demonstration in the area. The curfew is in effect from Sisnet Rural Municipality-5 Dhaulapahira in the east, from Ranikot in the west, from Sisne-6 Rukumgad to Dhaune in the north and from Sisne-5, Shahipark to Rumalbara in the south. Rukumkot has turned to a battle field due to scuffle in regard to the location of district headquarters.